PEARL HARBOR: Sixty-five years after the Korean War ended, the remains of dozens of American soldiers killed during the brutal conflict are finally coming home. Wednesday´s repatriation marks an important step after US President Donald Trump and North Korean leader Kim Jong Un held a summit, during which Kim agreed to send home the war dead. Trump, who has faced criticism over the pace of progress since the June meeting, praised Kim for "keeping his word," and Vice President Mike Pence met families when the remains arrived back in the US at a ceremony in Hawaii. 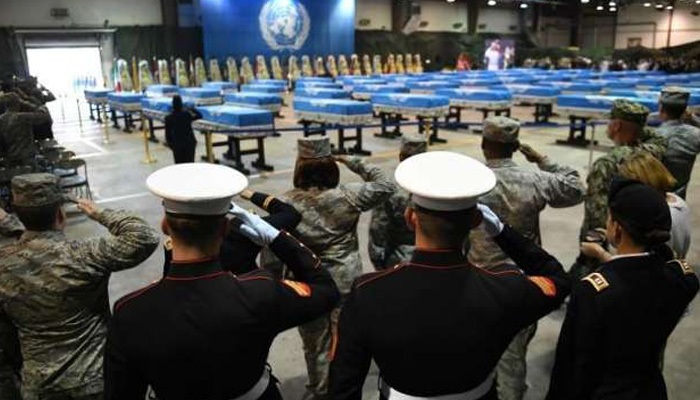 Caskets carrying the 55 sets of remains were draped in the blue-and-white flag of the United Nations. Many nations fought in the Korean War, but most of the cases are thought to contain US troops. More than 35,000 Americans were killed on the Korean peninsula during the 1950-1953 war, with 7,700 of these US troops still listed as missing in action -- most of them in North Korea. "Some have called the Korean War the forgotten war. But today, we prove these heroes were never forgotten. Today our boys are coming home," an emotional Pence said. "My dad, lieutenant Ed Pence fought in combat in the Korean War. He came back with a medal on his chest. But my dad, gone now 30 years, always told us the real heroes ...were the ones that didn´t get to come home," the US vice president said. It could take scientists and historians years to make final identifications. John Byrd, director of scientific analysis at the Defense POW/MIA Accounting Agency (DPAA), which has a large laboratory in Pearl Harbor, said preliminary findings suggest the remains are likely American. They "are consistent with remains we have recovered in North Korea... in the past," Byrd told reporters at Osan US Air Base in South Korea. The cases had been kept there since Friday, awaiting their repatriation to Hawaii for further forensic analysis. "There´s no reason at this point to doubt that they do relate to Korean War losses," Byrd added. Around 500 officials from the United Nations Command (UNC), the United States and South Korea attended a formal repatriation ceremony at Osan earlier Wednesday. "This is a solemn reminder that our work is not complete until all have been accounted for, no matter how long it takes to do so," said General Vincent Brooks, commander of the UNC and United States Forces Korea. After the ceremony, uniformed soldiers carefully loaded each case into two C-17 cargo planes, which later took off for Hawaii. Byrd told reporters that "there was a single dog tag (US soldier´s identity tag) provided with the remains." "The family of that individual has been notified," he said, though he cautioned that the tag is not necessarily associated with the remains in the box. The returned material also included military hardware and uniforms, including helmets, water bottles and boots. Former DPAA official Jeong Yang-seung, who previously worked on identifying US remains from the North, said it was unusual to locate dog tags during the search and recovery process. "It´s once in a blue moon that dog tags are recovered," Jeong, now professor of forensic anthropology at the Middle Tennessee State University, told AFP. "I don´t think North Korea is refusing to give dog tags when it has more but it probably doesn´t have dog tags lying around," he said. "So when... only one dog tag was provided, it´s probably not to tease the US but rather that it was sent because it could offer clues to the remains." DNA analysis, skeletal studies of bones, dental records and details of where the remains were found play a key role in such investigations. "If it´s identified quickly, it would be around five to six months, but if not, it could take decades," he said. Between 1990 and 2005, North Korea allowed 229 sets of remains to be repatriated, but those operations were suspended when ties worsened over Pyongyang´s banned nuclear weapons program. Following the June summit, Trump had declared that Pyongyang was "no longer a Nuclear Threat," but Kim did not publicly promise to end work at the country´s nuclear and missile facilities. Instead, he spoke of committing to "work toward" eventual denuclearization of the Korean Peninsula. He did not make any commitment to unilaterally disarm. Still, experts see North Korea´s return of the remains as an important gesture. "It´s a sign that they want to improve relations with us... and certainly for the families it´s significant," Joel Wit, founder of the respected 38 North organization that monitors North Korea, told AFP. Additionally, new satellite imagery from the Sohae Satellite Launching Station on North Korea´s west coast suggests workers are dismantling an engine test stand, in line with a promise made to Trump. Abraham Denmark, director of the Asia Program at the Wilson Center, cautioned not to read too much into the repatriation. "It is not a signal about Pyongyang´s willingness to denuclearize or even reform its ways, and policymakers should not be fooled or distracted from the primary source of tension -- North Korea´s nuclear weapons and ballistic missiles," he said.